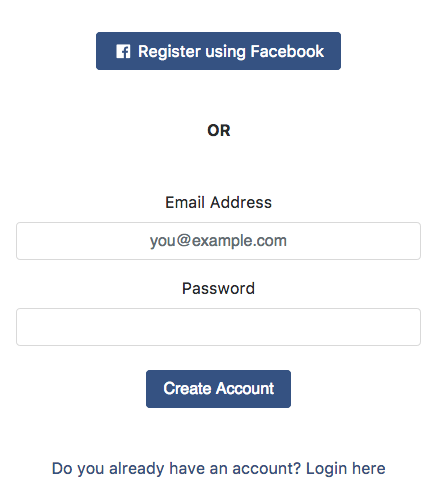 We're introducing a new login system that lets everyone choose between using their email address to set up a username and password or to use their Facebook account. Until now we only provided the Facebook option and we know that has been a problem for some people. We’re also adding a profiles feature in preparation for things that we have planned for release in the next few months. When you click on the Get Started button at the top right of our website, you will soon see a page that includes the options shown in the image. Here you can either enter your email address and a password or choose to use your Facebook account to register with us. If you choose to use your email address and set up a password we will automatically send you an email including a link that will enable you to complete the registration process and access our service. If you decide to use Facebook then you will be given access straight away. Just click the link underneath the Create Account button and login as normal. Once you've done that you have the option to set up a username and password and use that as an alternative to Facebook in the future, if you would like to do that. Your profile contains information about you including a photo, your name and your location. You can add or update your profile at any time. You don’t have to do this but as we add more features in the coming months it will become more useful for you.